There’s no guaranteed way to know if a person truly loves you. That being said, there are definitely some telltale signs that your significant other really does care about you. The key is to pay attention to how your partner ACTS and focus less on what they say. 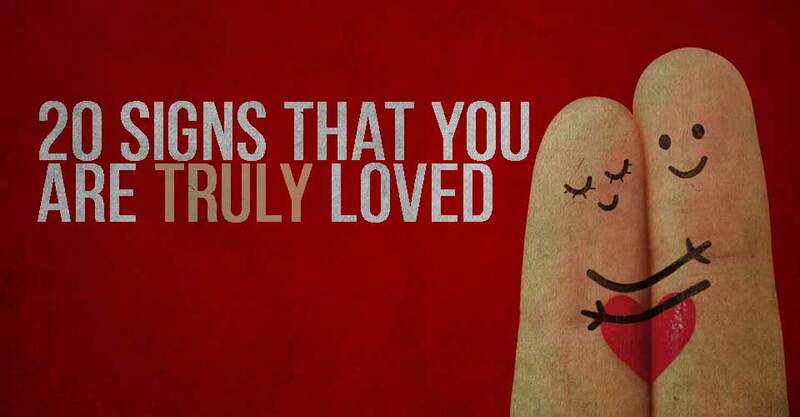 Here are some signs to look for that show that your significant other truly loves you. 1) No matter how great your day might be going, your special person will find a way to make it better. 2) Your partner loves you truly when he/she talks about the future including you in it. True commitment means seeing a forever with another person. 3) A key indicator of successful long-term intimacy is investing time in the relationship. A true partner would always be willing to spend time with you, no matter what is going on in their lives. 4) If your partner is kind, considerate, and respectful, he/she loves you truly, a relationship cannot flourish without mutual respect. 5) They won’t hide their true self, they would act the same way around you as they do around their friends. 6) Love requires giving to someone with no thought of how it might be repaid. If your partner loves you truly, he/she will strongly believe that love can never be repaid. 7) They won’t judge your mistakes, they won’t hide it from you too, they will reveal it to you in a calm and peaceful way. They will be comfortable with telling you when you’ve made a mistake. 8) Actions speak louder than words, observe if your partner stands according to his/her words, observe if they keep their promises, if they do, they are in love with you for sure. 9) Does your partner ask about your day? If they seem to show interest in your life, it’s because they care for you. 10) If your partner gives you compliments that show that he/she really appreciates the important aspects of your character and personality, then there’s a good chance he/she really loves you. 11) If someone really loves you, they won’t try to change you, they will accept you for who you are. 12) If your loved one really loves you, then they’ll really open up to you, they would never try to hide anything, including how they feel for you. 13) You can tell for sure that your partner loves you, when he/she trusts you, people will trust someone only if they care for them truly. Can you trust him with your life? 14) They will respect when your opinion, even if they hate it. They would listen to whatever you have to say. If the person truly loves you, then he’ll care about what you think. 15) They would be committed to the relationship and they will never give up on you. Love itself is rooted in commitment. 16) Part of being in love is just being able to listen. It’s not all about being able to talk. If your partner listens to anything and everything you say without arguing or interrupting, you can be sure that they are in love with you. 17) A partner who truly cares for you will make you feel good about yourself by boosting your self-esteem. They would help in increasing your self-confidence, if you find yourself with someone who makes you feel good, you better be sure that he/she is the one. 18) They will be always there for you, a person who loves you truly will always be there for you through the good times and the bad, through thick and thin. 19) Part of being in love is always wanting to be around the person you love, it might be hard and impossible at times, but if they love you truly they will put some tiresome efforts to make it happen. 20) If the love is true and honest, they will respect your privacy and will not demand you to spend more time with you. They would know when to give you space, if your partner wants to be around you all the time, then that’s not love, it’s infatuation. Mature love is in respecting the other person’s time and space.